Rent this Sigma GECE-3+ for only $13.15 per week. Sigma guitars are very popular. There are forums, websites and fanpages dedicated to them and its rare to see a second hand one on the market. 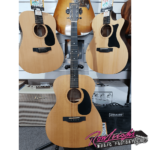 All of that speaks volumes about the quality and care that goes into making them and how well they play and with a wide range to choose from you’re sure to find a guitar that works for you.